It is somewhere between 1960 and the late 1970s, on the fringes of a major port. Worn down black steam engines are reaching the end of their days, green diesels have arrived but are soon swept away by a tide of corporate blue paint - the colour of trains from my teens. 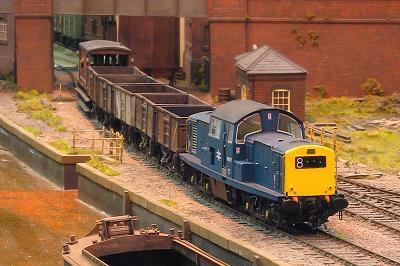 Soon all shunting nationwide will be handled by the universal Class 'O8', but not quite yet. and wharves. Sometimes the loaded trucks will be checked on the weighbridge before onward movement. The region and period of the scene change throughout the day, showing the many local types of diesel shunter which used to be found around the country. The changes in railway livery and traffic between the years 1960 and 1979 are portrayed. More than twenty types of shunting and mainline diesel locomotive appear, along with over forty different designs of wagon from the British Railways era. Gorpleton Blymee represents a GWR branch line at the end of the Company's existence in the late 1940's just as the new British Railways took over. When the original line was laid out in the late 1890s, Gorpeton Blymee would have been an intermediate stop on a through line but it became the inadequate terminus of a branch when the owner ran out of funds. 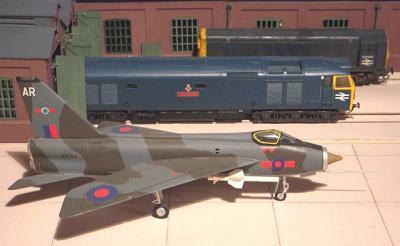 The GWR took the line under its wing mainly to stop one of the interloper companies breaking into its territory. The financial loss outweighed the inconvenience of competition elsewhere. Years in the doldrums followed but in 1905 Wilgar and Edson set up their factory. The business boomed, even in the depression years, which resulted in the town expanding and rail traffic mushrooming. In the early 30's, Wilgar and Edson expanded rapidly and later, during the war, they undertook increasing amounts of MoD work. All the work is 'hush, hush' and so secret that we (its creators) have no idea what they makej. However, the raw materials enter the factory and the 'under wraps' finished products give us some intriguing clues. To shunt the factory, Wilgar and Edson made some astute purchases of second-hand motive power. Consequently the single platform and the goods yard no longer meet the needs of the community. The demands of the Second World War meant that no action was taken to resolve the problems created by that inadequate infrastructure. The recently established British Railways Board have plans to redevelop the station and re-position it on the other side of the factory, where it will be closer to the town centre. 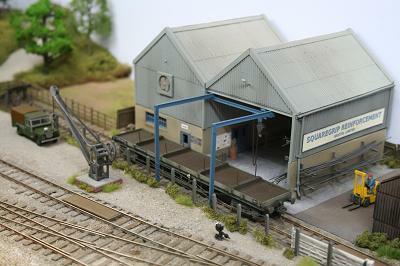 The layout was originally built by Rodger Main and was called the The Salt Marsh. This was an accurate representation of part of a French metre gauge line, the Tramways de la Vendee, which ran down the west coast of France until the 1950’s. It was based on the Musee de la Petite Gare at Ile d’Olonne in the Vendee region, this was a station belonging to Tramways de la Vendee. 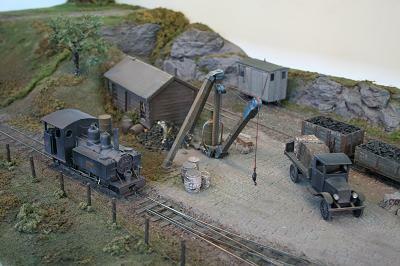 The layout is now owned by Simon Newitt and has been moved several hundred kilometres inland to somewhere in central France, rebuilt and renamed. The backscene on this layout is a modified photograph taken from our Dutch Barge on the Canal du Nivernais, near a village called Cravant, in Burgundy. Notice the vineyards on the hills in the background. The local wines (Vin Regionaux) are excellent! 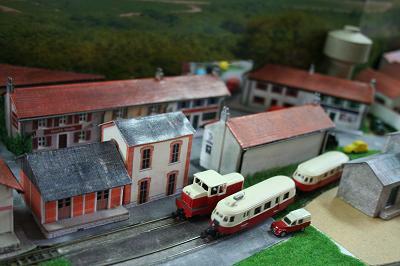 This layout is being used as a scenic test bed for my next Nm exhibition layout, Chatel sur Yonne. This will be based in the Yonne valley in Burgundy, our favourite part of France, with lovely scenery, great wines and wonderful canals to cruise. 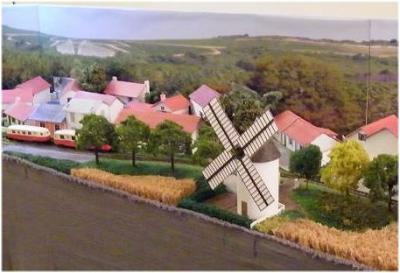 The scenery, buildings and road vehicles are all N Gauge scale but the track is Z Gauge (N Scale narrow gauge). This allows a relatively accurate representation of the once extensive French Metre Gauge secondary railway system. 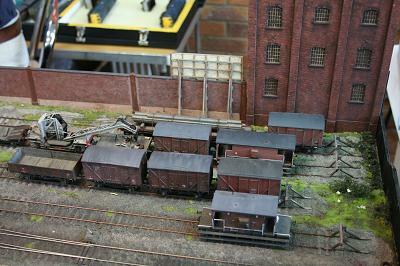 Railcars (Autorails), diesels (Locotracteurs), coaches (Voiture Voyages) and wagons (Wagons Marchandises) are all to N Gauge Scale but running on Marklin Z Gauge chassis. The original German outline Z Gauge bodies are removed and replaced either by resin castings made in France or scratchbuilt bodies. Rivendell was originally one end of the Twickenham and District club's narrow gauge layout but ended up stored in my loft for 10 years, until I was talked into rebuilding it. Time and an attentive squirrel partially destroyed it and one of the boards had to be scrapped. 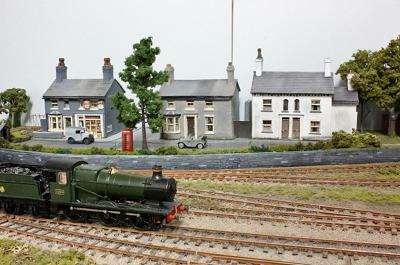 The baseboards were modified, track work re-laid, re-wired, buildings rebuilt and the scenery completely replaced. (It may have been easier to build a new layout). The neglected feeling attempts to depict narrow gauge railways in the 1930s, as bankruptcy loomed, but represents nowhere in particular. The rocks are plaster castings from rubber moulds, the wooden buildings were all scratch built, the fences made from Chinese calendars from our take-away and the trees constructed from Scalelink etchings. 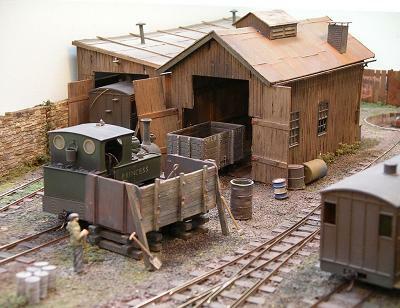 Note the stub points in the goods yard although they were unlikely to have been used on the prototype depicted by Rivendell. A full history and a large number of photographs have been published in Narrow Gauge World number 48 and the British Railway Modeller Annual 2007. 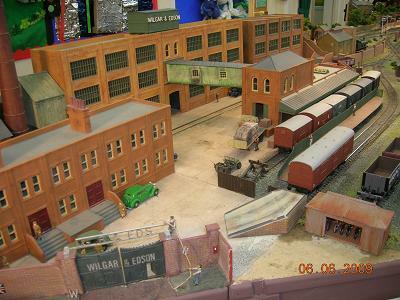 Sandy Lane, although a fictitious layout, is loosely based on Old Oak Common diesel depot on the Western Region of British Railways. 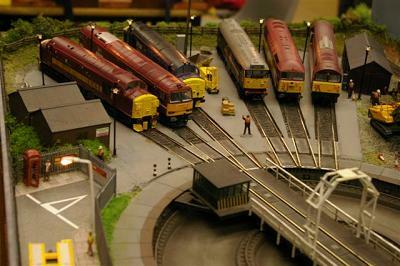 The layout was built in the 1990s, but now has been brought up to date and converted to DCC control. The diesel locomotive fleet consists of ready-to-run units. All locomotives are fitted with DCC decoders, some with sound. 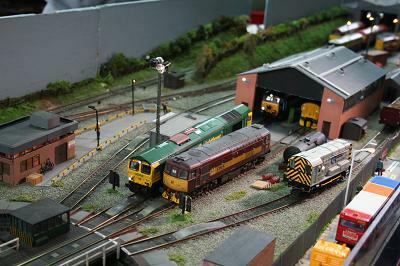 The layout is not operated to any set sequence but is run to show the variety of diesel locomotives that have run on the various companies from year 2000 to the present day. Yeoford, 11 miles west of Exeter, was the junction station for the LSWR lines to Plymouth and North Devon, the actual divergence being a mile to the west at Coleford Junction signal box. The wide arches of the stone over-bridges and wide spacing of the platforms were inherited from the broad gauge North Devon Railwayj. The LSWR extended the station as part of its double track main line between Waterloo and Plymouth, adding up and down bay platforms together with a small marshalling yard on the down side. 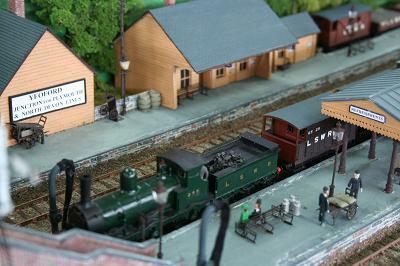 During our chosen Edwardian period, we operate a timetable to include a sample of the more than 60 daily trains, including local passenger and goods trains from Exeter together with passenger trains or through coaches from Waterloo and goods trains from Nine Elms, together with stone trains from Meldon Quarry and coal from Fremington Quay. 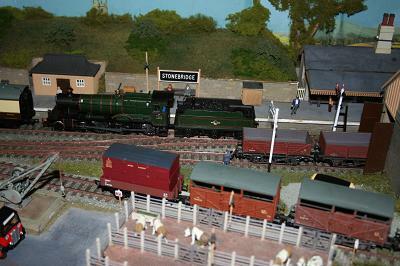 The Exeter and Torrington Travelling Post Office also runsj. Some slower trains are shunted into sidings to allow faster trains to overtake, with connections being made. As advised on the station nameboards, passengers travelling between stations on the North Devon and Plymouth lines alighted from trains on the up platform, crossed the footbridge and awaited a down train, making use of the refreshment room if time permitted. Luggage and parcels were transferred by trolley over the foot crossing. Mainly Adams and Drummond locomotives haul period trains, passengers being carried mainly in non-corridor stock but some new corridor coaches do appear. 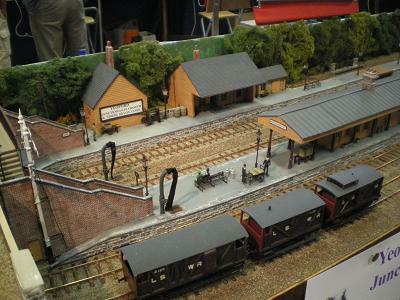 All the essential features of the curved Yeoford Junction layout are incorporated, although the length has been reduced, mainly in the sidings. Two extra bridges have been incorporated to get trains 'off-stage' behind the sidings. 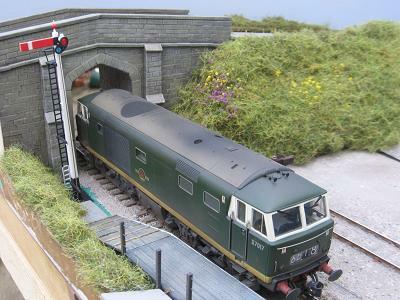 All bridges and buildings are hand-built, based on the North Devon and South Western structures at Yeoford. Track is hand-built using EMGS components, most rolling stock is built from kits with some scratch-built and the locomotives are powered by Portescap motors.